This morning I went to check out the Pride sims. Second Pride 2015 opened yesterday and the festival is set to run for two weeks, with lots of DJ parties and other events happening for the LGBTQ community and their friends and supporters. 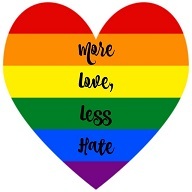 Second Pride, like Pride events in RL, is a meaningful event in a number of ways; to bring people together, to give a sense of community and identity, to offer safety and acceptance to those who cannot celebrate or be ‘out’ in their real lives, to have a presence in the virtual world and beyond. Pride is not about, ‘oh yay look at me and my sexuality,’ it’s about not being ashamed of who you are, it’s about highlighting the discrimination and hate that many LGBTQ people still face in the world and working hard to change that, it’s about offering a safe, happy space to be with friends or make new ones, it’s about being able to dance or hold your loved one’s hand and not be afraid to do that, it’s about knowing you are not alone. Tags: Equality, Festival, Gay rights, LGBTQ, Love, Pride, Second Life, Second Pride, SL. Bookmark the permalink.